Before walking up the old railway bridge I turned around and took this picture. It was the sunset time; the sky was yellow, and a tiny orange cloud sitting at the skyline looked like a puff of smoke left by a distant steam engine rolling at full speed into nowhere. There is no train, the bridge is abandoned. Too late, the last train is gone. I used to know a woman who acted like she was fifty even when she was twenty. Never changed. Never married. When I was overwhelmed with caring for my young daughter, studying and doing several jobs she would say : The one who lives slowly lives long. Another woman, my mother’s colleague, never got married and never had any friends because she had a heart problem. She would do her gardening, sit on her porch and take long and slow walks. She would wind up an old gramophone and put it outside – I loved it! She is in her 80s now, still doing pretty much the same things. I wonder, did they miss their train? Growing older, I often feel like I am standing in the platform and watching the others board the train and leave. I cannot catch up. My ticket has expired, and my luggage is all over the place. Isn’t it a time to start living slowly? And now there is only a puff of smoke left at the skyline. Inese – Amazing food for thought and I love the photo of the train tracks at sunset with the water for ‘reflection.’ I once had a favorite greeting card that read, “When my train arrives, I’ll be at the airport.” I’ve felt that way a few times over the years when I couldn’t seem to get things to come together. Especially when life is ever so hectic. When we become over melodramatic, my best friend and I tell each other we’ve been at the station to long. That’s our way of gently telling the other that we’ve been on the same track for too long and it’s time to move on. Sheri – I am so glad that the post has a personal touch for you! The invention of the railway did so much for humanity 🙂 It is so wonderful that you have a friend with whom you have developed some sort of a special language – it shows how close is this friendship. Thank you Ellen! I love that song. Amazing post, exquisite photo. Poignant reflections. I’m glad to know you that much better, Inese. Someone once told me there is a saying in Korean than you can live short and thick or long and thin(ner). His uncle was a mean, selfish man who commited suicide in his 40s. Short and thick. I think our contentment is a great measure of how well we have lived although it is always good to step back, assess, and even change tracks as needed. Thank you for you comment! It is so true about stepping back and assessing because even if it seems too late, we still can change the tracks and keep going. Thank you again, this comment means a lot. Wonderful writing, Inese. And absolutely truth. Life has its rules and we do not feel strong enough to change them. Afterwards, when there is only a puff of smoke left at the skyline, then we remember with guilt. But it is too late. Anyway, I am just remembering another train:. Lino – thank you for your comment and for the song. You are so right about the rules of life: very often I physically feel the limits and boundaries I cannot step over, even that I know it would have changed a lot. Something resists, like invisible wall. We cannot fight against life. ‘Did they miss their train?’ I’m going to steal that for a poem, you know! Fantastic post. Love the music, the post, and the reflections. I always think of ‘Sliding doors’ and those moments in life when sometimes a choice, sometimes chance sends you one way or another with completely different results. We never know, but we have to fully own our life and make sure we live it such as it is, rather than always worry about where we are going. It is indeed the journey that is important. Thank you for your comment, Olga! I too think that we should focus on our present, and live today, otherwise we will get nowhere. Loved your blog as usual. I took an image of a graphophone in St. Augustine at the LIghtner Museum. I can visualize the woman on her porch listening to records. It was in the early 60s. We didn’t have any device to play music outside, except her Gramophone. My friend and I would dance till we drop. Tales from the Vienna Woods – my first classical music experience. God bless that lady, her name is Leontine. Great photo, love the bridge and that teasel just peeking up at the bottom. But your words are also very thought-provoking, poignant and beautiful Inese. Thank you so much for your comment, Andrea. It means a lot to me. A railroad ran thru the town where I grew up. 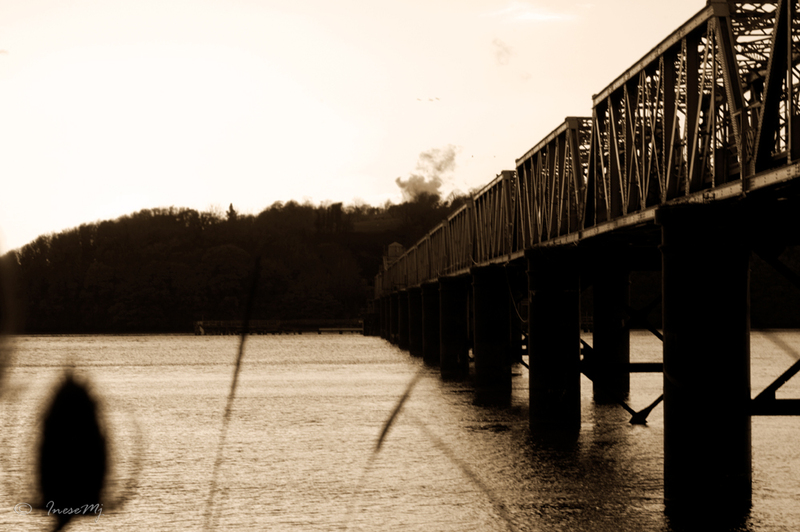 We used to play on the tracks, and on the bridges which we called trestles. I even fell off a box car one time and hit my head on the coupling. That may explain my weirdness. Or, it could have been the time I fell thru an opening in a hay loft and hit my head on the floor of the barn startling the cows which were being milked at the time. It’s amazing I’m still alive. Lovely photo Inese and wishing you a great weekend! This post made me think of things I have missed. There are plenty and most of them have to do with letting chances to be loving to slip away. True! Thank you for your comment! Thank you Christy, it is what I think too. We are “winded up” to a certain speed, each of us different. this is a delight to read – reflective, poignant and the (often sad but happy too) truths of our passing lives. Thank you for your kindness, John. I love my life but I am not really sad that it is passing: there is time for everything… Missing some people makes me sad though. And lately – feeling inadequate some times. Great pic. Very nostalgic feeling. Interesting analogy of the train with time passing by. I think Eastern philosophies use a river in a similar way, but yours is more urban and graphic. The song is great and goes really well with your thoughts. An interesting view for seeing how should we go along in life. I think you are right that sometimes it seems that we are not fast enough to catch everything. Perhaps, we should slow down and just lets things go by and enjoy the slow pace..
Isn’t that one an eloquent way to highlight the continuity in actions… Such an interesting linguistic approach, don’t you think?. “I am reading” adds some personal touch, some intimacy – doesn’t it? Thank you so much for being so kind ! This is an amazing post. And, the song brings it all together…. I´m sure we all wished we could have done more for a family member that has passed and have done more with our lives and that photo is very melancholic, the colours almost seem to be painted. Plus you add the song on top and this was yet another great post.